The purpose of print templates for goods out notes and channel mapping is to enable you to print out the right goods out notes during goods out processing. 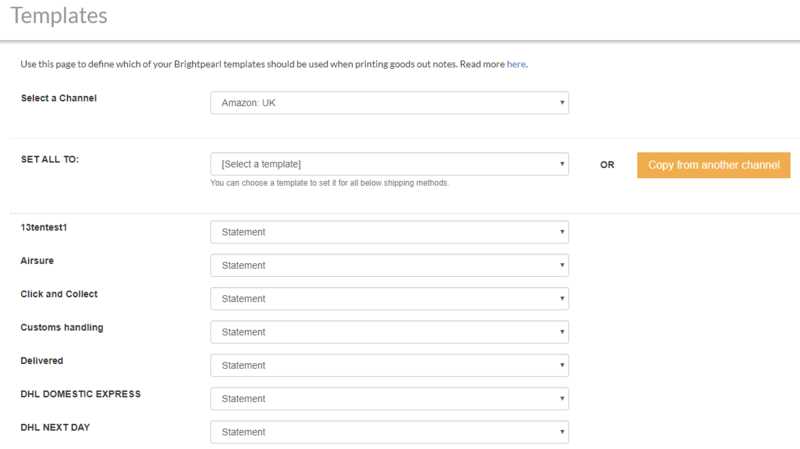 Since different sales channels and shipping routes require different content for goods out notes, Warewolf > settings > templates gives you the ability to associate the right template to the right channel / shipping method combination. Channels like Brightpearl, have functionality to create and edit print templates. Typically by using a simple text / html editor. If you have been processing goods out notes in the channel but are migrating to Warewolf then you may wish to mirror template mappings from there. To see how templates work in the goods out process, click here. Print templates are synced to Warewolf from the channel. For example, Brightpearl > settings > templates > document templates provides the template source to Warewolf for Brightpearl customers. See their help documents for further information. Bear in mind that print templates need to be manually synced. Sync is needed after new templates are added or where existing ones are edited. To manually sync, login to the backend and navigate to manage accounts > channel updates. Then click ‘update now’ next to the templates option. In settings>templates, select a sales channel from the dropdown list. Warewolf opens the shipping methods list. If desired, select one template from the dropdown. Then save. This will set the print template for goods out notes to be the same for all shipping methods. Alternatively, click ‘copy from another channel’. Then select the channel to copy the template selection from there. In many cases, goods out notes need to be shipping method specific. Perhaps to take account of shipper address label formats. In this case, go down the list of shipping methods and select templates individually.